Congress recently passed the Small Business ACE Act which raises the appraisal threshold for 504 loans secured by commercial real estate to match the federal banking regulator appraisal threshold amount for commercial real estate transactions. Previously, SBA required a real estate appraisal if the estimated value of the 504 project property was over $250,000. 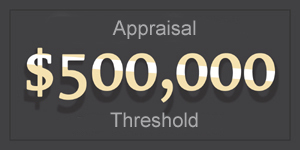 The new law raises the SBA 504 appraisal threshold to match the federal banking regulator threshold, which is currently $500,000. SBA requires a real estate appraisal if the estimated value of the 504 project property is over $500,000 or at $500,000 or less, if SBA determines that an appraisal is necessary for appropriate evaluation of creditworthiness.